For a certain type of child, there is nothing better than anything tiny. Tiny books, tiny toys, tiny leaves and flowers. These are the children that tend to have elaborately tended dollhouses–no matter how patchily put together–and shelves full of miniature ‘found’ objects. Children who like tiny things often like books about tiny creatures. Joining the grand tradition of The Borrowers, The Littles, and myriad others, is Richard Peck’s new book Secrets at Sea. Peck’s book is part of what I call the ‘Mice in Outfits’ genre (The Rescuers, The Mouse and His Child, The Mousewife — all of which I adore), but he couples that tradition with his own particular sensibility. Secrets at Sea is the story of Helena, the eldest of a (distinguished but recently diminished) family of mice (Louisa, Beatrice and Lamont) who are living in the same Edwardian-era Hudson Valley house as the Upstairs Cranstons, a somewhat vapid family who decide to go to England to give their awkward eldest daughter a chance to catch a husband. The mice — in spite of their fear of water — go along, of course, and while the Upstairs Cranstons’ journey pays glorious dividends, the Downstairs Cranstons’ reaps completely unexpected results. More like Fair Weather than any of Peck’s more recent books, Secrets at Sea is full of lovely details for both the tiny-oriented (a grand yardstick dinner table, spools for chairs, soup served out of thimbles), and those who love adventurous capers. Even young Titanic enthusiasts might enjoy reading about a non-doomed ocean voyage for a change. Secrets at Sea is recommended highly for all kinds of readers. Most children like to yell, and this book encourages children to shout along if they know the answer. The book covers a variety of concepts including counting, the alphabet, colors, animals, and vehicles. The illustrations are bursting with energy, and children will enjoy seeing what the mouse is doing on each page. And of course, shouting along with each page. Sarah brings you the last video review of 2011. At the back of The Third Gift, in the last sentence of her author’s note, Linda Sue Park writes that “stories can help remind us that we are as much a part of [history] as those whose names dominate the headlines.” Her latest book, The Third Gift, is a tale illustrating how the lives of the humble folk, the “everymen” of the world, often intersect with those of the mighty at crucial points in history. The father and son at the center of the story are so ordinary that Park doesn’t even give them names. They could, indeed, be anyone. It’s evident, however, that the two are far more than ordinary to each other. The boy speaks reverently of his father’s abilities. The father is patiently intent on teaching his son his craft. And an extraordinary skill it is. He is a collector of “tears,” the small globules of hardened sap that appear when the bark of a certain tree is slit in a very specific way. The trees are native to the desert regions of the Middle East and northeastern Africa. The pearls of sap are in fact myrrh and although the gorgeous illustrations have a dateless appearance, the time is actually revealed to be about 2,000 years ago. As you may have guessed, this is a Christmas story of sorts. It tells of how thousands of years ago, the Magi might have obtained a perfect globe of myrrh, used as both incense and as an embalming oil, to present along with their gold and frankincense; to the “new king” they sought. The exquisite art work exudes light and life. The drawings have a photographic quality that draws the reader into the scene adding a note of reality to a fictitious tale. They are the perfect foil for Ms. Park’s story which seems to be part historical fiction and fairy tale. I foresee The Third Gift becoming a family favorite and future Christmas classic. Dumpling Days continues the story of Pacy and her family, whom we met in the books The Year of the Dog and The Year of the Rat. In this book, Pacy and her Taiwanese-American family go visit their relatives in Taiwan for an extended summer trip. At first, Pacy feels out of place because she can’t speak Chinese and everything about Taiwan is so different from what she is used to. But we see that as Pacy spends time with her loving relatives, eats many dumplings, and has many small adventures (like having her fortune told, taking Chinese painting classes, riding to the top of the world’s second tallest building, and getting lost at the night market), she realizes that she belongs to both Taiwan and America. And that’s the way she likes it. Dumpling Days stands on its own, but I recommend all three of the Lin family books. I love Grace Lin’s gentle storytelling – insightful, sweet and humorous. I love getting to know all the members of the family, and how family stories and histories are woven into the text. I love how the stories are complemented by our narrator Pacy’s simple line drawings, and the way Grace Lin so deftly and gently handles Pacy’s exploration of her own complicated ethnic and personal identity. While the first two books take place in Connecticut, Dumpling Days takes place entirely in Taiwan (the opening and closing scenes are on the airplane). I enjoyed learning about customs and life in the different places Pacy and her family visited, and I very much enjoyed reading about the food that they ate! I will warn you, however: this book will make you hungry. Hungry for food, adventure, travel, and the love of good friends and family. This highly recommended book is released January 2, 2012. 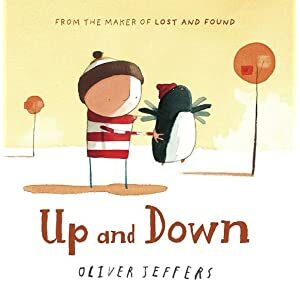 This is the fourth book by Oliver Jeffers about the boy and his penguin. In the first book, Lost and Found, the penguin shows up at the boy’s house and the boy goes to great lengths to help him find his home, only to realize at the end that the place the penguin really belongs is with the boy. At first, the boy tries to help the penguin fly using hilarious techniques like ever increasing sized balloons tied around the penguin’s waist. Eventually, the penguin decides that flying is something he must do on his own. The boy and the penguin head to the zoo so the penguin can learn to fly from the other flying animals. While at the zoo, the penguin finds a poster advertising the perfect flying opportunity. The poster states: “Ever Dreamed of Flying? Are you short [and] fat? The Traveling Show is looking for a new Living Canon Ball.” The penguin is so excited he leaves to find the Circus without telling the boy and the boy doesn’t know where he has gone. The remainder of the story follows the boy as he looks for the penguin and the penguin embarks on becoming the newest “Living Canon Ball” in the Circus. In the end, the boy rushes in just in time to catch the penguin as he is shot out a canon with a pillow and the two friends are reunited. Besides the delightful watercolor illustrations, the language in this book makes it one to be read multiple times. Jeffers is from Northern Ireland and the text has a delightful lilt. True to the title, this story takes on a rollercoaster effect, with many up’s and down’s. It ends delightfully with the boy and his penguin safely together again. I have always found the traditional Mother Goose ditties to be dated and old-fashioned. As cute as some of the rhymes might be, who knows what a peck of pickled peppers is? Who knows about maids a-courting or maids a-waiting? What are curds and whey? What are swine and farthings? Well, along has come a great new ‘recycled’ version of Mother Goose, filled with hilarious earth-friendly bits of rhyming wisdom. Many of the same characters are present in this new book, like Jack Sprat, Little Jack Horner, Old Mother Hubbard, and even that precocious little girl who had that little curl right in the middle of her forehead. In this new version, the little curl was on top of her head and it glittered. When she was good, she recycled all she could, but when she was bad — she littered. Mary still has her little lamb, but since his fleece was sooty and black from the coal-fired plant, Mary and her lamb now work for cleaner air. Little Jack Horner is still in his corner, but he’s not eating, he’s replacing all the outmoded light bulbs. Old Mother Hubbard shops for tofu and organic treats for her poor dog and she shops with cloth shopping bags. The fun and beauty is that each of these ditties is set in lyrical, playful, whimsical, ecologically-friendly verse. What a hoot! Even the illustrations are terrific, composed from newspapers, ticket stubs, and other reused materials. This is a fun, silly way to groom young ones into thinking ‘green’ and to enjoy a hip new Mother Goose.